Green water is a technology commonly used in aquaculture. The benefits have been shown for several (marine) fish species, molluscs and crustaceans. The method consists of adding algae in the water during larvae culture. Proviron's Prime freeze dried microalgae provide a one to one replacement of live algae for your larval fish and shrimp at equal performance (survival rate, growth, rejections, …) . Leave for 5 minutes to rehydrate and gently mix (spoon mixing is sufficient) again. 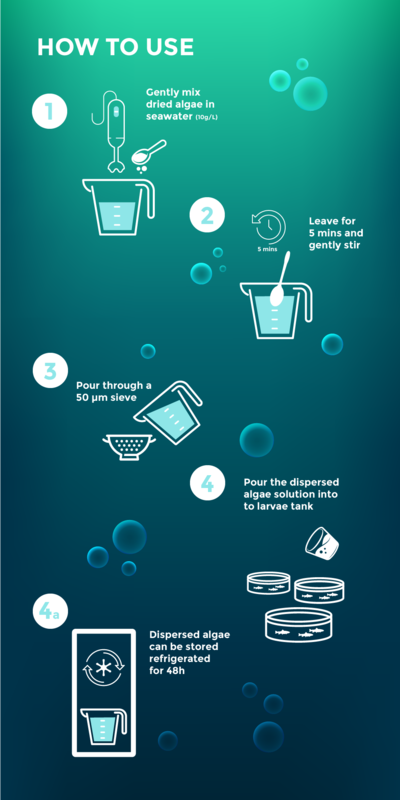 Pour the algae dispersion through a 50 µm sieve before use in the larvae tank. A pre-concentrate of algae can be prepared per day and stored in the refrigerator. Provirons microalgae readily and absolutely disperses into single cells without leaking its content. As a result it retains the characteristic buoyancy of live algae and remains in the water column for very long periods without fouling your tanks.